USS KEARSARGE was the 16th ESSEX - class aircraft carrier and the third ship in the Navy to bear the name. 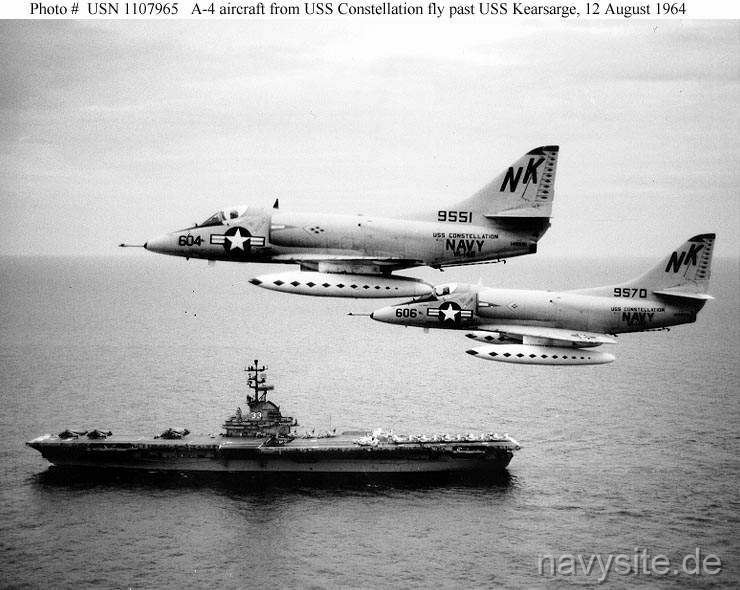 KEARSARGE was redesignated as attack aircraft carrier CVA 33 on October 1, 1952, and antisubmarine warfare aircraft carrier CVS 33 in October 1958. 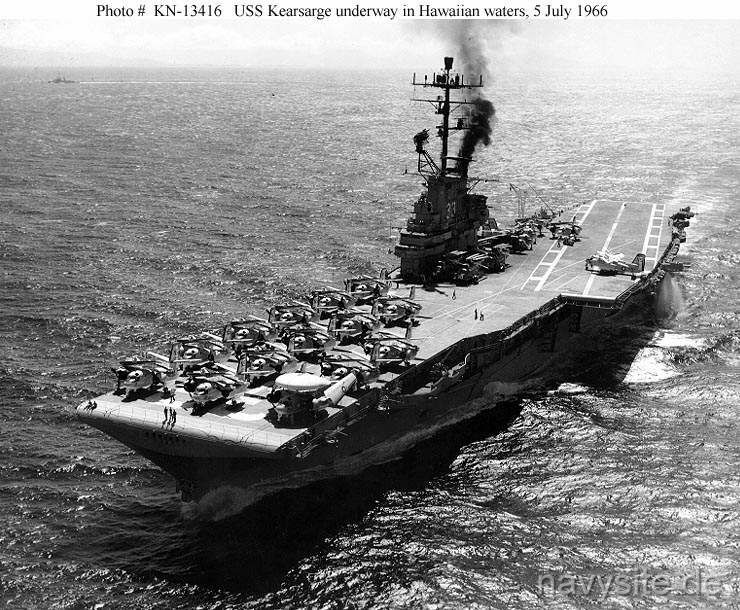 Made redundant by the general fleet drawdown of the late 1960s and early 1970s, USS KEARSARGE was decommissioned on February 13, 1970. Following three years in the Reserve Fleet, she was stricken from the Naval Vessel Register in May 1973 and sold for scrapping in February 1974. This section contains the names of sailors who served aboard USS KEARSARGE. It is no official listing but contains the names of sailors who submitted their information. Click here to see which USS KEARSARGE memorabilia are currently for sale on ebay. November 5, 1962 off California USS KEARSARGE and USS MATTAPONI (AO 41) are slightly damaged in a collision during refueling. December 3, 1962 off Long Beach, Calif. USS KEARSARGE and the SS ORIANA collide in dense fog. ORIANA suffers a 20-foot hole near its bow and the KEARSARGE suffers a 25-foot rip about ten feet aft on the starboard side. December 23, 1967 Sasebo, Japan USS KEARSARGE suffers a fire while docked in Sasebo, Japan, for the holidays, killing three and injuring two. 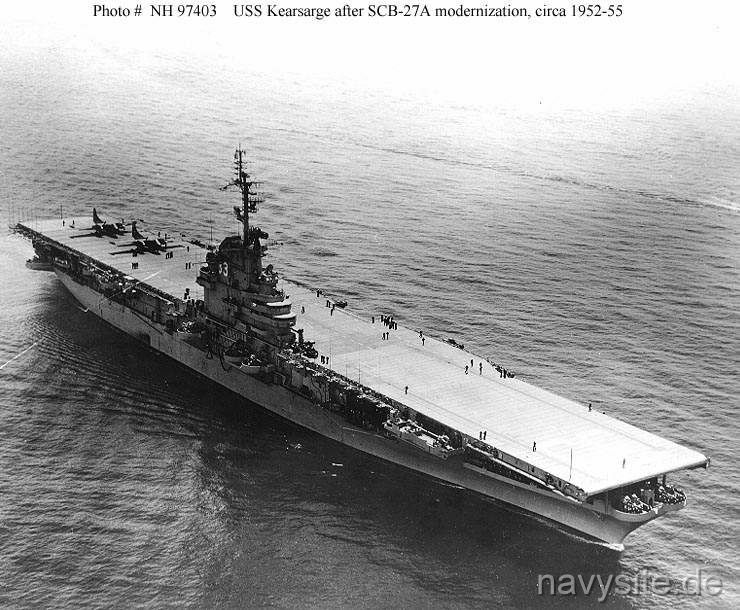 USS KEARSARGE was launched 5 May 1945 by the New York Naval Shipyard, New York; sponsored by Mrs. Aubrey W. Fitch; and commissioned 2 March 1946, Captain Francis J. McKenna in command. During her tour in the Mediterranean, units of the 6th Fleet were placed on alert to insure peace in the Arab-Israeli area. KEARSARGE returned Quonset Point, R.I., 2 October 1948, and operated along the Atlantic Coast and the Caribbean until 27 January 1950 when she sailed for the west coast. The carrier arrived at the Puget Sound Navy Yard 23 February, and decommissioned there 16 June 1950 for a modernization overhaul that would enable her to handle new jet aircraft. 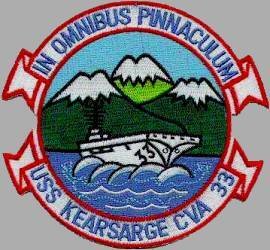 KEARSARGE was assigned a new role in October 1958, becoming an anti-submarine warfare (ASW) support aircraft carrier, with the new designation CVS 33. 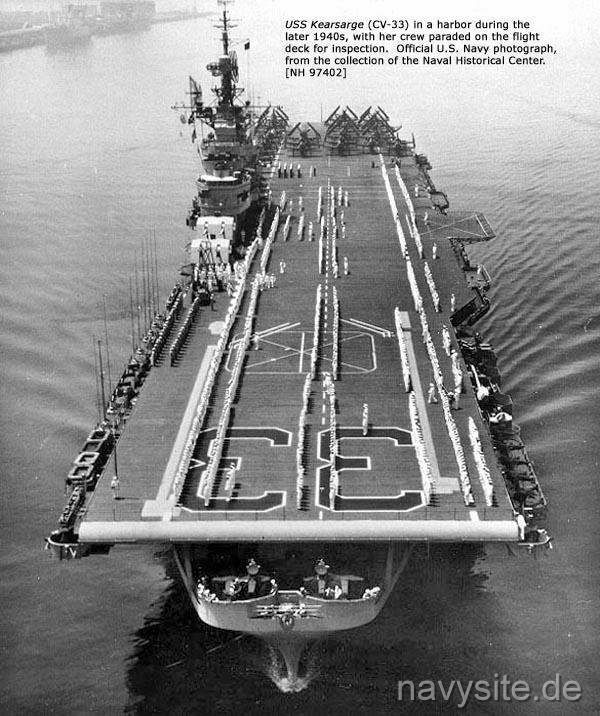 Following intensive training in her new role, the carrier sailed 5 September 1959 for 7th fleet operations in the Far East. Early in her tour, Japan was hit with a violent typhoon, and KEARSARGE played an important role in providing relief to the victims. Her planes landed parties of medical and supply units, while her crew and air group donated clothing and money to the distressed people. After participating in SEATO exercises and 7th Fleet operations, she cleared Yokosuka, 3 March 1960, for her homeward voyage. Three days later in stormy waters 1,200 miles off Wake Island, four Russians were rescued after drifting 49 days in disabled landing craft. They were flown back to their country after KEARSARGE arrived Alameda, Calif., 15 March; and the carrier received thanks from the Soviet Union for this gesture. A year of training operations preceded her next deployment from San Diego which began 3 March 1961. The anti-submarine carrier steamed to Southeast Asian waters as the Communists intensified their effort to overthrow the government in Laos. 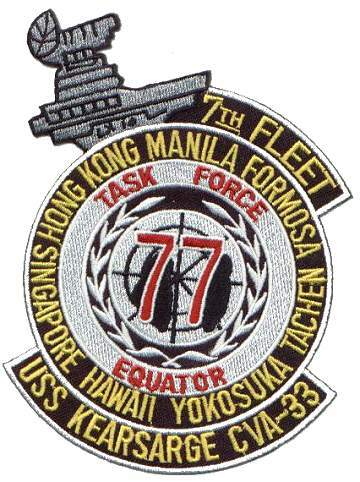 The power and determination of the 7th Fleet was observed by the enemy and the crisis eased. Peace prevailed. After 6 months in the Far East, KEARSARGE arrived Puget Sound 1 November for the second phase of her modernization. Upon completion of repairs and training, KEARSARGE departed Long Beach, 1 August 1962, to station herself in the Pacific missile range as a recovery ship in the Mercury orbital space flight of astronaut Walter Schirra. In October, after a flawless flight, the carrier played her role in the space age by retrieving Schirra and his capsule and returning him to Honolulu for flight back to the States. Six months later, 19 June 1964, the anti-submarine carrier was deployed on her ninth Far Eastern cruise. Arriving Yokosuka 30 July, KEARSARGE was dispatched to the South China Sea, following the North Vietnamese patrol boat attack on U.S. destroyers in the Gulf of Tonkin. While U.S. Navy planes destroyed North Vietnam oil and supply depots, KEARSARGE provided anti-submarine protection for the 7th Fleet. The decisiveness of American action persuaded the Communists to delay their objectives for the time being; and KEARSARGE returned Long Beach, 16 December 1964. 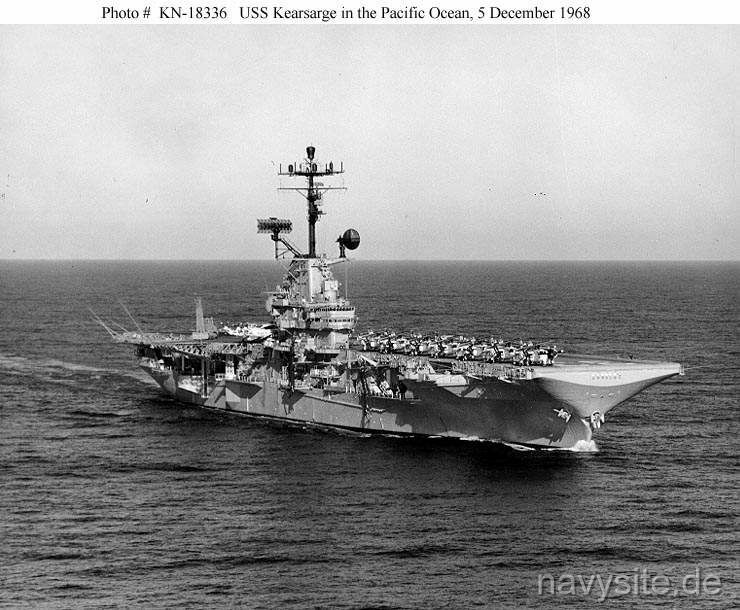 After overhaul during the first half of 1965, KEARSARGE operated off the West Coast until sailing for the Far East 9 June 1966. Steaming via Hawaii and Japan, she reached "Yankee Station" 8 August and operated off Vietnam through 24 October. The next day she headed for the Kuala Lumpur area and anchored in the Strait of Malacca on the 30th. She returned via Subic Bay to "Yankee Station" 5 November and operated there through the 23d. The next day, the carrier started home via Hong Kong and Japan, arriving San Diego 20 December 1966. She operated on the west coast until departing San Diego 18 August 1967 and reached Pearl Harbor 10 days later to prepare for future action.